Wall Cabinet with Glove Box: 15 in. x 12.25 in. x 4.75 in. 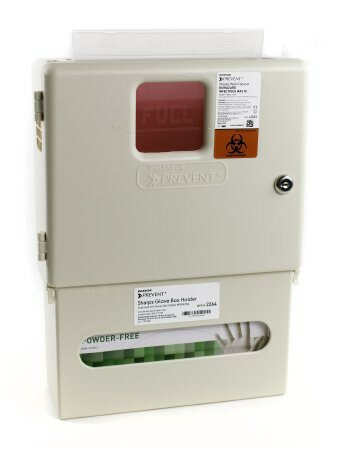 The McKesson Prevent Sharps Wall Cabinet with Glove Box is an effective and useful tool in keeping gloves at a level for staff and keeping sharps containers away from floor and ground level where it can be opened accidentally. The opportunity to wall mount and lock a sharps container is a safer method that should be strongly considered. 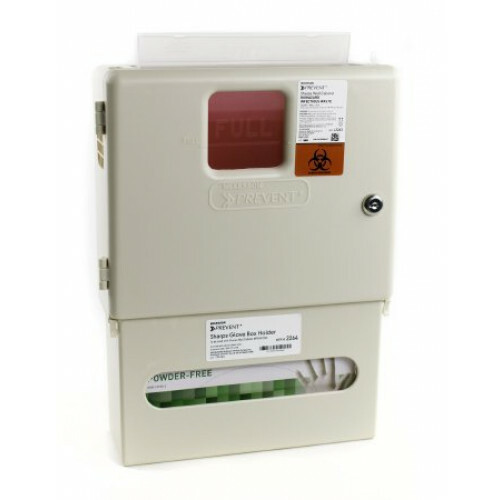 The McKesson 2265 Wall Cabinet Mount is a compatible sharps container for 5-quart sharps containers but more specifically for the McKesson 2261 5-Quart Clear Prevent Sharps Container and the McKesson 2262 5-Quart Red Prevent Sharps Disposal Container. These sharp containers that are compatible with the wall mount can be locked in place once they are hanged inside the cabinet, by being able to provide security and safety through lock-and-key features. The McKesson Prevent Wall Bracket with Locking Cabinet is made with a cream-colored design to blend in and mesh naturally with the ambiance of the environment and feel of the office. The wall-mount locking cabinet also holds exam gloves for staff at a level that is easier to reach. Most medical offices keep gloves at a quick level of grasp and away from areas or surfaces that can contaminate the gloves. With dual-ability to provide safety in locking and convenient in reach, the wall-mount cabinet is a more than great option.